Orthodontics – the treatment of irregularities in the teeth and jaw, which includes the use of special appliances such as braces – typically begins between the ages of 9 and 14. However, the American Association of Orthodontists recommends children to undergo an initial screening at age 7. If my child doesn’t have all of his or her permanent teeth yet, why should we consider orthodontic treatment? Is there danger in beginning orthodontic treatment too early? 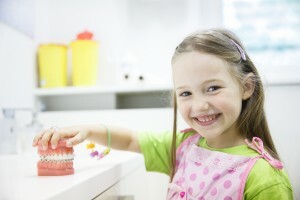 It’s good to know that the primary purpose of an initial screening is to evaluate the condition of your child’s teeth. Many orthodontic problems are already apparent by the age of seven, and identifying these can help parents and dentists plan for the future. In most cases, treatment won’t begin right away. But some children and conditions are much easier to treat if caught at this early stage. If your child is clearly diagnosed with certain ailments, it may be best to begin orthodontic treatment as soon as possible. Crossbite is a condition where the upper teeth close inside the lower teeth. If caught early, certain devices may be used to gradually and painlessly correct the problem, before the jaw has fully developed. Otherwise, more complex treatments may be required – possibly even oral surgery. This condition occurs when the jaw is too small to accommodate all of a child’s permanent teeth. Often, early orthodontic treatment will help manage this problem. At the very least, it can shorten the time your child will have to wear braces in the future. This condition leads some children to have problems with self-image. Protruding teeth may also cause severe bite problems, which can cause difficulty chewing, swallowing, and speaking. Early detection and treatment may successfully correct the problem without need for surgery. In addition to the aforementioned conditions, early orthodontic treatment is used to help correct various habits that are detrimental to your child’s oral health, such as thumb sucking, tongue thrusting, and mouth breathing. If your child is approaching the age of seven, we recommend making an appointment for his or her first orthodontic screening. In this way, any problems of the mouth can be detected and diagnosed, and a treatment plan formed right away – preventing further complications.